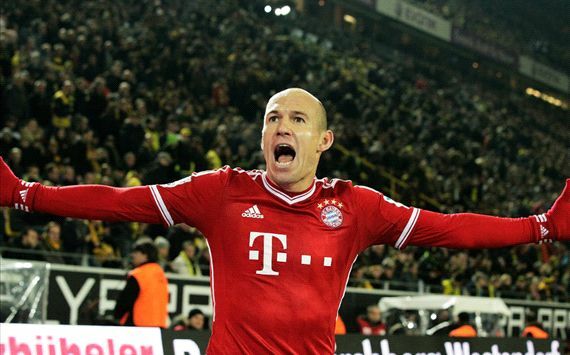 For 65 minutes of Der Klassiker on Saturday, Bayern Munich and Borussia Dortmund were rather evenly matched. Certainly, Jurgen Klopp’s defence looked a little shaky – after all, they were missing their entire starting back line – while they were neither as measured nor seemingly as comfortable in possession as their visitors. But while Die Borussen may be light on bodies at the moment, they weren’t light on heart and they created the better chances; Marcos Reus didn’t make the most of one opportunity, while Robert Lewandowski certainly should have scored early in the first half. But as the match ticked on, and Pep Guardiola tinkered with his XI – bringing on Mario Gotze and Thiago Alcantara and exchanging an unusually direct style (featuring Javi Martinez in an advanced midfield role) for one featuring greater intricacy and penetration – Bayern took control. And in the end, the Bundesliga leaders romped to victory. A quite sumptuous opener from the Westfalen-returnee Gotze – showing precisely why the Bavarians spent so much money to take him during the summer – Arjen Robben with an impudent chip and Thomas Muller handed Die Roten a 3-0 success. It was all the more remarkable because, quite simply, they didn’t even need to get out of third gear to do so. Throughout the game, they may not have reached anything like the heights of their 3-1 win over Manchester City earlier this season, and they certainly missed Ballon d’Or contender Franck Ribery and the irrepressible Bastian Schweinsteiger. But nevertheless, they still had too much quality and street-smart for Klopp’s heavy-metal thrashers, who weren’t allowed to impose their hard-pressing, fast-countering style to anything like the extent they did in August’s 4-2 Super Cup win. Bayern may not have thrilled, they may not have impressed throughout, but they did what was necessary and completed the job. At the heart of Bayern’s success were excellent performances from Dante and David Alaba on the left side of defence, while Toni Kroos – fresh from a classy performance at Wembley in Germany’s 1-0 win over England – was calm and composed throughout. 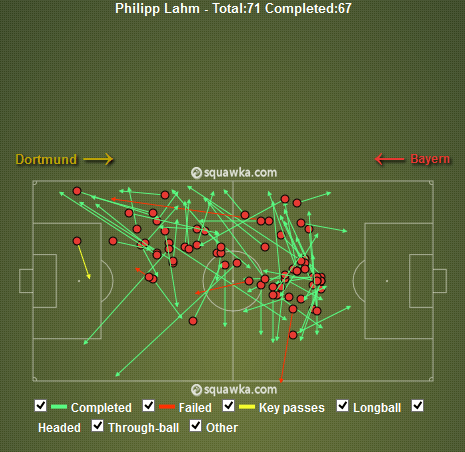 The star man however was Phillip Lahm, the Bayern skipper once again magnificent as the sole anchorman in midfield. His passing metronomic, his reading of the game sublime, for 90 minutes he was head and shoulders above all others – his performance beautifully rounded off with the assist for Muller’s third goal. Even when Bayern weren’t at their best, they were just too strong, too intelligent, too clinical for the side expected to run them closest in the Bundesliga again this season. They, like Dortmund, had players missing, but in the end they made light work of that fact. And that’s worrying, for contenders both German and European. The gap between Klopp’s boys and Guardiola’s charges is now seven points, with BVB having lost three of their opening 13 matches. Already it looks too high a mountain to climb, and while Die Borussen may have scaled Ben Nevis numerous times in recent seasons, Bayern are now more starting to resemble Kilimanjaro. Borussia Dortmund CEO Hans-Joachim Watzke has declared since his side’s defeat that they simply cannot compete. Even with a fully-fit XI, featuring the much-vaunted talents of Ilkay Gundogan and Mats Hummels, he may not be wrong. The Bundesliga continues, week-in, week-out, to resemble one of Europe’s most watchable knife fights, with action, wonderful talent and plenty of goals. However, unfortunately for the 17 sides who don’t ply their trade at the Allianz Arena, the European champions continue to rock up to said knife fight with a shotgun very much their weapon of choice. Is the Allardyce bubble about to burst?